Hello and welcome to my Knotty World. If you are here by some sort of rubbish Google search mistake, please feel free to stop a while, You may just enjoy what I have to say. Most of it far more interesting than your search for counter screw plastic grommets or whatever. Grab a chair and put your feet up. I’ll be honest, I didn’t set out to write a blog. Creative writing is not one of my strong points. I do have a warped sense of humour though and life provides me with some great laughs. So I decided to write them down. Keeping a diary is so last year darlings so a blogger I became. For those of you who have no idea who I am, my name is Sue. I live on the south coast of the UK with my partner Roger and a rather bonkers chocolate labrador, Nelson. I have a full time job too, I’m a legal drug pusher for a large German company and I run my own little online company. More details here. We own a boat called Jessica. Owning a boat brings a whole new set of problems to life. 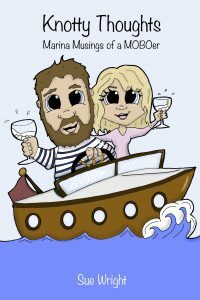 Most boaters will find themselves relating to some of the observations and cockup’s noted here and the stories will undoubtedly bring a wry smile. Owning a boat and a dry sense of humour go hand in hand. They say “worse things happen at sea“. Actually most of my life disasters have been on terra firma. Oooo not quite true, there was the great Tower Bridge incident. You can find all about that on here too. So if you are here by design, thank you and enjoy. If you are here by mistake you have already got this far. I suggest you either try again with your google search or have a quick look. You will love it. You never know what you might be missing…..